Do not lean on the lectern. The lectern is there to hold notes, hide awards, and to support the microphone and other electronic devices. It is not a leaning post. Holding on to it with a white-knuckle grip announces to the audience you are nervous. Stand straight, a few inches away from the lectern, with both feet firmly on the ground. Gentlemen button coats. A buttoned suit jacket is a must for male speakers. During the speech, keep it buttoned if the speech is formal and/or does not require any arm waving or extreme body movement. Women may also button their jackets, however, because women's styles vary, a buttoned jacket is not required; women suffer enough having to wear high heels. Shake hands with the person who introduced you. 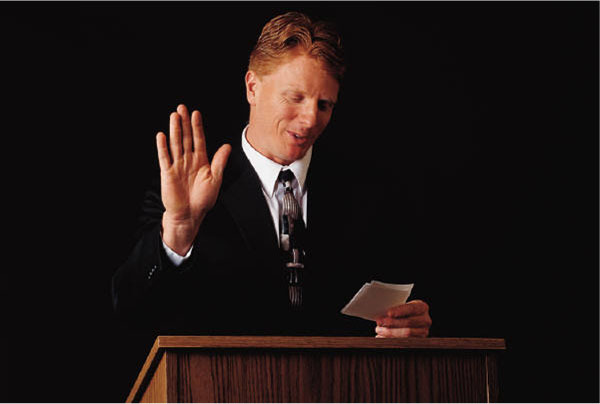 In days gone by, when a person approached the lectern after the introduction, the introducer handed over control of the meeting by passing the gavel to the person being introduced. Today, with a handshake, control of the lectern occurs symbolically while giving an appearance of continuity and friendship. It is rude to both the speaker and audience to introduce a speaker and then leave the lectern unattended as the speaker approaches. The lectern or podium is the focus of the audience's attention; do not jeopardize the professionalism of your event by leaving it unattended. Always thank the introducer and greet the audience. Proper etiquette requires good manners. Before beginning your speech, it is polite to thank the person who introduced you and to greet the audience making a special greeting to dignitaries, government officials, and other special attendees. Remember you were invited and consider it a privilege. Familiarize yourself with proper introduction techniques. Learn proper introduction techniques and practice choreography at the lectern before-hand, if possible. The introducer and the guest speaker should not appear to be dancing as they exchange positions. Do not apologize for lack of preparation. There is no substitute for preparedness, however, there are times when preparation is not possible. Never apologize for lack of preparation! This insults the audience who will be wondering why you showed up and why you are wasting their time if you are not prepared. Cancel or postpone the engagement or, when this is not possible, take a few minutes to gather your thoughts, outline them on paper, and proceed with your speech. Chances are no one will even notice you are unprepared so why make it a point to tell them? If you are frequently called upon to speak at a moment's notice, prepare a "pocket" speech you can pull out and give anytime, anywhere, with variation. Eliminate distracting habits and verbal crutches. Those uhs, ahs, and ums can be very distracting and annoying. Practice your speech and record it to identify verbal crutches. Jitters can create havoc on your nervous system without you even knowing it. Nervous distractions like jiggling, tapping, hand clutching, etcetera, can detract from your talk. Learn good speaking posture, slow down, take a few deep breathes, and exhale any uneasiness. If you have a great speech and have practiced it, concentrate on relating your message to the audience, rather than how it is going to be received. Your delivery will appear natural and effortless if you concentrate on delivering your message with enthusiasm and sincerity. Every gesture, look, motion, and sound should have a purpose. Although body movement can enhance a message, movement that is made for the sole purpose of movement appears unnatural and awkward. Use hand and body movement to emphasize a point or to help the audience visualize. Naturalness comes with knowing your speech and practice. Practice relating the concept of your speech rather than practicing gestures. This technique brings out the natural you. Do not lose eye contact. Some talks are made to be read, others are not. Whether your notes are for reference only or meant to be read, poor eye contact is distracting. Good eye contact is a learned skill; practice. Do not thank your audience. As children, we were taught that it is polite to say thank you. It still is but, after a speech, it is erroneously used to fill in the space after the last word has been uttered. As you have already thanked everyone at the beginning of your speech, deliver a powerful closing, then simply turn it over to the next person with a smile and a handshake. You forgot the part where you should not show even the slightestfear of public speaking. No one will bother with a speaker who can't speak straight. You should do more focus on practice for your Effective Presentations skills.